Urgent! I lost all my voice memos on my iPhone 5. They included really important memos for work and now I don't know what to do. Can anyone tell me how to recover the voice memos? Lots of people use Voice Memo to record important talks, favorite songs in daily life. But sometimes people lose them after installing a new iOS system such as iOS 12/11 or delete them accidentally just like Lynn and are wondering how to get the important voice memos back. The article will introduce 2 ways to help you recover deleted voice memos on iPhone XR/XS Max/XS/X/8/7/6s/6s Plus/6/6 Plus/5s running iOS 12.1/12/11.3 or older versions. Can You Recover Deleted Audio Files on iPhone? You may wonder the question whether you can recover deleted voice memos or audio files from iPhone. Here you will find the answer which is YES. All the deleted data are not erased immediately, so it is still possible to get tham back before overwriting. You can use iMyFone D-Back iPhone Data Recovery or iMyFone iPhone Data Recovery for Mac to recover deleted iPhone Vice memos whether you have a backup or not. The following tutorial will show you three different ways to get your voice memos back. Recover 22+ files such as photos, videos, messages, WhatsApp messages, notes etc from iPhone or iPhone backup. Allow to preview data before recovery and retrieve data selectively. 4 recovery modes: Smart Recovery, Recover from iOS device/iTunes backup/iCloud backup. 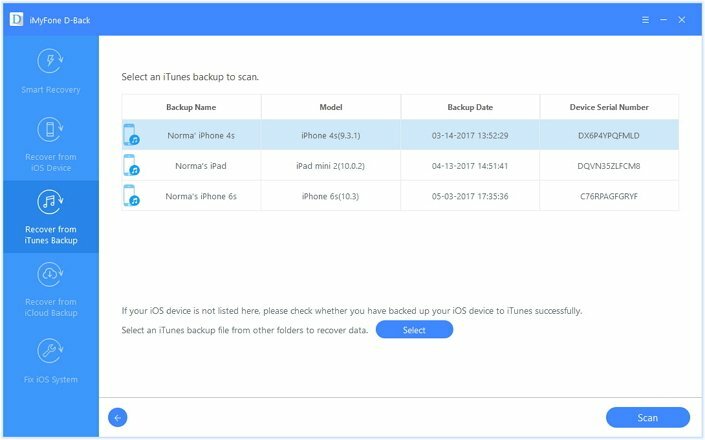 Support data recovery for almost all iOS devices running different iOS versions, including iPhone XR/XS Max/XS/X/8/7 and iOS 12.1/12/11.3. You may need to download and install the program on your windows or mac computer before running it. 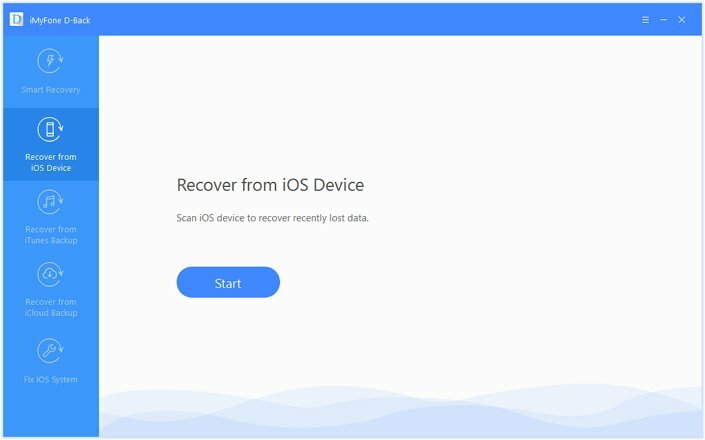 Run iMyFone D-Back iPhone data recovery on your computer and choose "Recover from iOS Device" mode. Click "Recover from iOS Device" and choose Voice Memo for the subsequent search. The program will invite you to connect your iOS device to the computer. After a few minutes, the memos will be displayed on the next window. Preview and select the ones you need and click "Recover" to save them to your PC. Recovering your missing voice memos will be easier if you have a backup on iTunes. Follow these simple steps to get them back. From "Recover from iTunes Backup", choose the file type(s) you need to recover. And of course, here you should check "Voice Memo". There will be all the backup files you have created by iTunes. Choose the one that includes the voice memo you need. And then, iMyFone D-Back will scan the backup to find your voice memo. And then, all the found voice memos will be shown on the window. You can preview only the deleted ones by choosing "Show only deleted ones" on the top box. Click "Recover" to save them to your computer. To recover deleted voice memo iPhone from iCloud backup is pretty similar to recovering from iTunes backup. Step 1.Just click "Recover from iCloud Backup" mode. Select Voice Memo as the file type you want to extract. 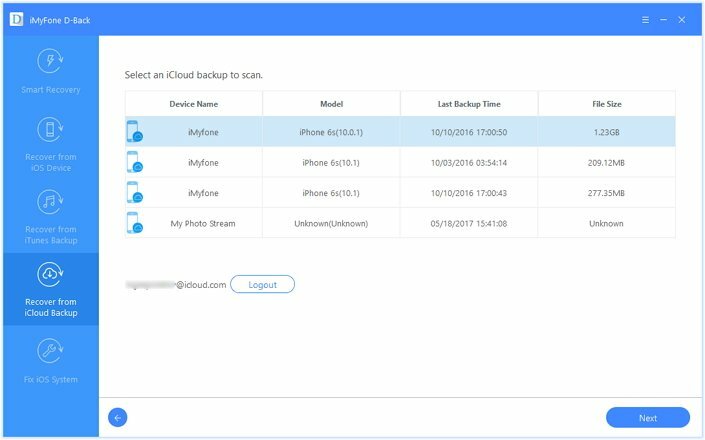 Step 2.Log in your iCloud account to download the right backup file for the scan. 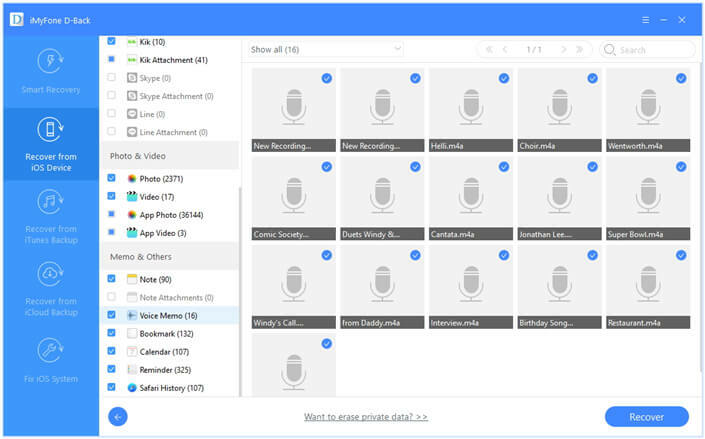 Step 3.Preview the voice memos from the screen and choose the right ones to recover. If you have made iTunes or iCloud backup regularly and you are sure that the voice memos you want are in the backup file, you can fully reset and restore your iPhone to get them back. However, some data like new photos on iPhone will also be erased and replaced during reset and restore and you can't preview and selectively choose the voice memos you want. And this is the reason why we recommend iMyFone D-Back as the primary solution. 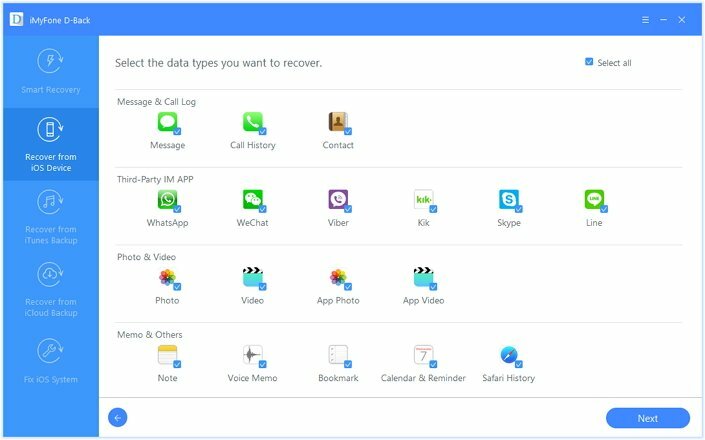 Comparing with the second method, iMyFone D-Back iPhone Data Recovery Windows version or iPhone Data Recovery Mac version is the perfect data recovery tool to help you not just get your voice memos back but all other types of data including contacts, messages, notes, WhatsApp messages, Viber messages and more. It comes with a free trial version to help you learn more about it. Just download and have a try! It is now compatible with the latest iOS 12.1/12/11.3. Can I use this software with a number of different iTunes accounts / Phones? Hello Gregory, thanks for your comment. The personal license works only for one device. But the software can help you recover data from iTunes backup files with different iTunes accounts, as long as there are stored on local computer and you have entered the right login account info. Awesome! I was able to recover a message that was very important to me. So glad I found this!! iCloud is always so confusing to me. Do you have any more info about backing up on the iCloud? I have reinstalled my itunes and all my backup files are no longer there. please help me..
Hi i have just downloaded the free version to see what can i get back and it does not show any of my recent icloud back ups although my last back up was yesterday but i can not see that one. so how would i retrieve my deleted files? Hello Sam, we have sent a mail and a beta version of our product to your email address. Please kindly check them. Please feel free to contact us if you need any further help.